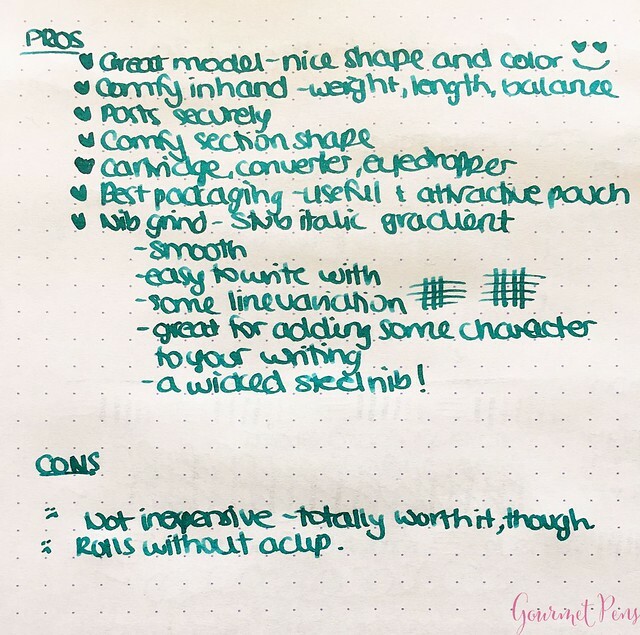 Thank you to Franklin-Christoph for sending this combo for a review! Nib: #6 Broad Steel SIG (by Jim Rouse) Audrey will now be doing the SIG so don't pass it up! Weight with converter inserted but not ink is: .05 lb, or 22.7 grams. Thumbs up. I really like Franklin-Christoph's packaging. I hate having a bunch of pen boxes, even the gorgeous, really interesting ones. I just don't have space or interest in keeping them. This Model 20 Stabilis came in a black leather, zippered pouch with a soft suede-like interior. 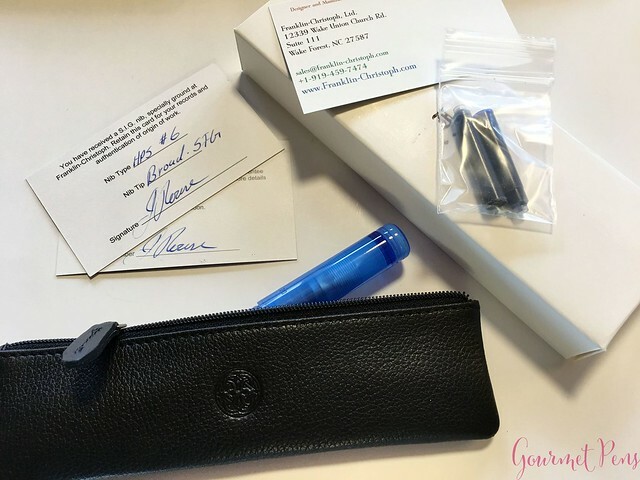 The pouch and pen were delivered in a simple, light, recyclable white cardboard sleeve. Not only is it less wasteful than a larger clamshell box, but it also weighs less (for shipping). 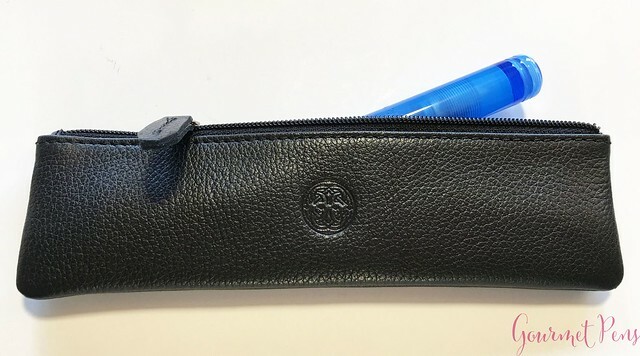 The zippered pouch is something that can be used as a pen (or pencil) pouch, or it can be used to lend a friend a pen... it has more than one use! The Model 20 is a round pen with flat, rounded ends. Both ends are beveled with two grooved rings on each side. 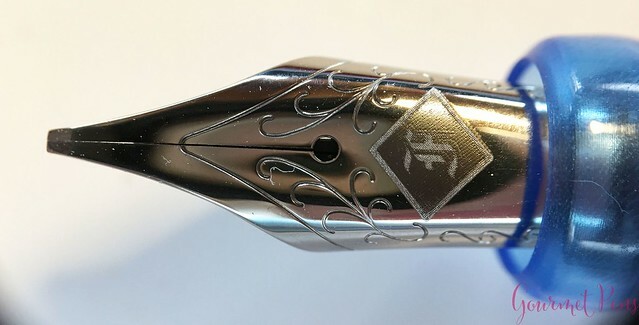 The finial is engraved with the Franklin-Christoph logo. My model has no clip but you could add one if you prefer. I like the clipless look. 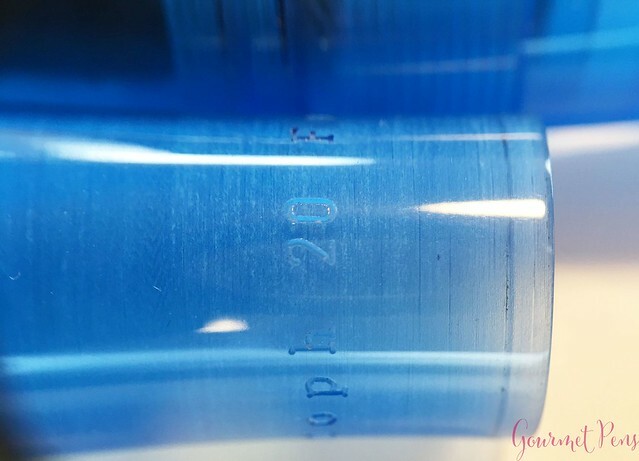 The cap is engraved with Franklin-Christoph 20 near the end. The section is small and round with a pinched shape. There are no cap threads because it is a slip cap. The Maya Blue is clear with a frosted finish. 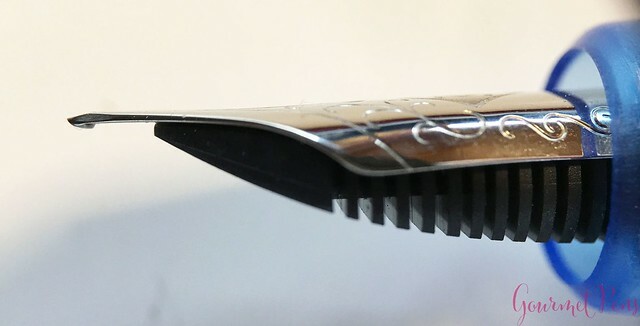 The nib is visible through the cap, which has a conical shape inside. You might think a clear pen is plain but I like the clean design elements here. The Model 20 is the right size and shape for me. It's simple but it works for me. 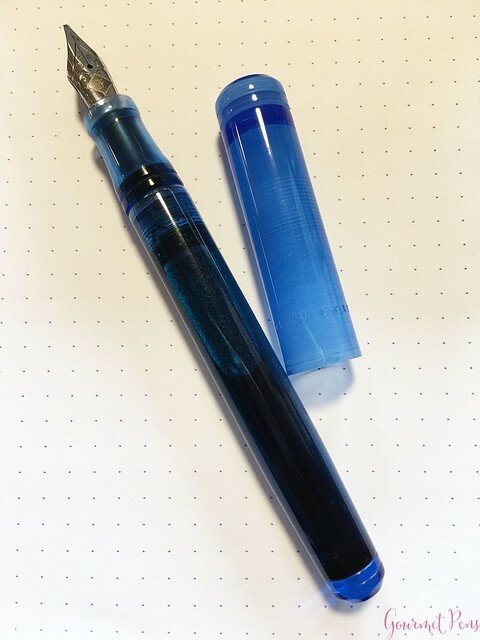 My favorite finish is still the Antique Glass but this is great if you don't actually want to see your ink all the time. I know. Some people are like that. It's so weird. The nib on this pen is a #6 broad steel SIG - a stub italic - that was ground by Jim Rouse. The nib is slightly recessed in the section. 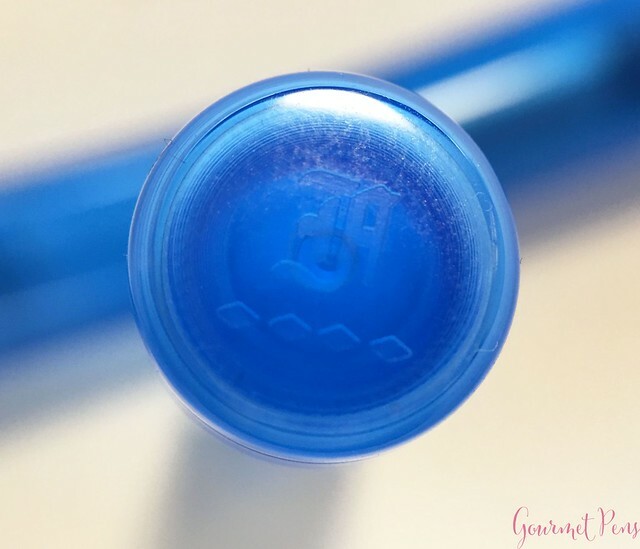 It has a single slit, a round breather hole, and is engraved with the Franklin-Christoph logo along with the JoWo flourishes. If you have ever wondered whether a gold nib is required for a smooth writing experience, this nib will end that for you. While a gold nib may offer other things, this broad SIG is one of the smoothest, most pleasant steel nibs I have ever used. 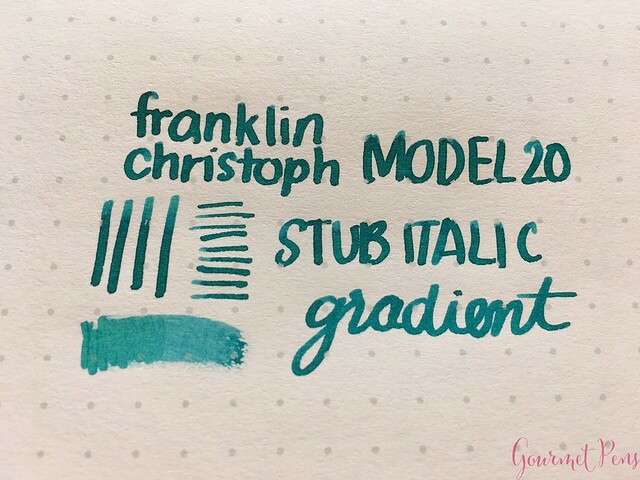 It is a medium wet writer and because of the stubby shape, inks shade well. 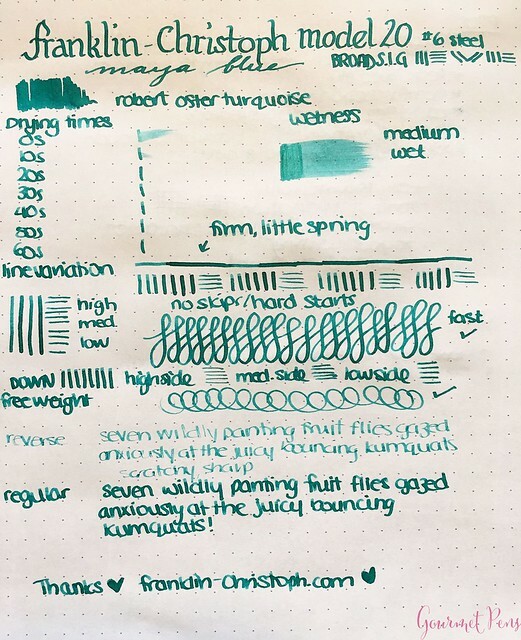 Drying times are fast so the nib can easily be used as a daily writer. If you find the broad too wide but you still want the variation, go for a fine or medium SIG. 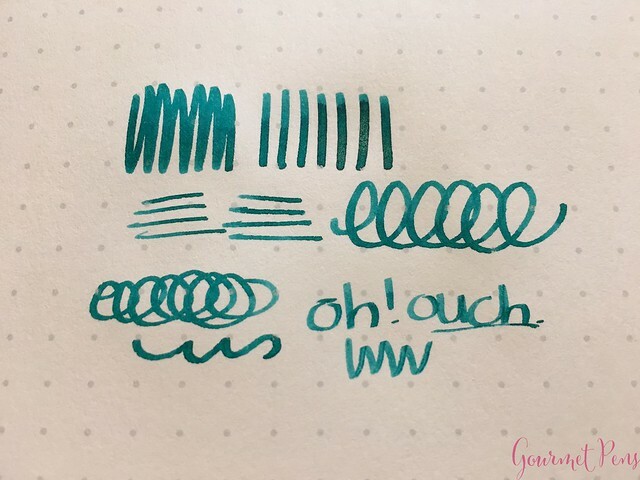 It's a firm nib with only a tiny bit of line variation if you apply pressure. No skips, no hard starts, well tuned, well adjusted. 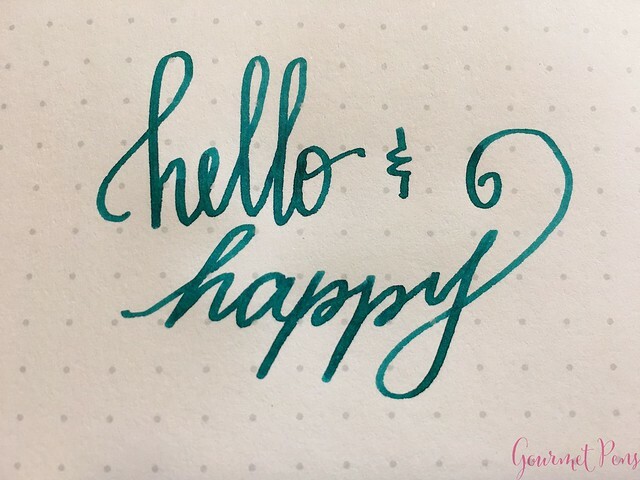 The SIG is smooth and easy to write with while still offering some character and line variation to one's handwriting. That is the idea of the nib - the smoothness of a stub with the line variation of a cursive italic. I think the SIG is the perfect in-between grind, especially if you have not used a cursive italic before. Personally, I love the sharp variation of a crisp, formal italic but I enjoy the SIG for casual use. 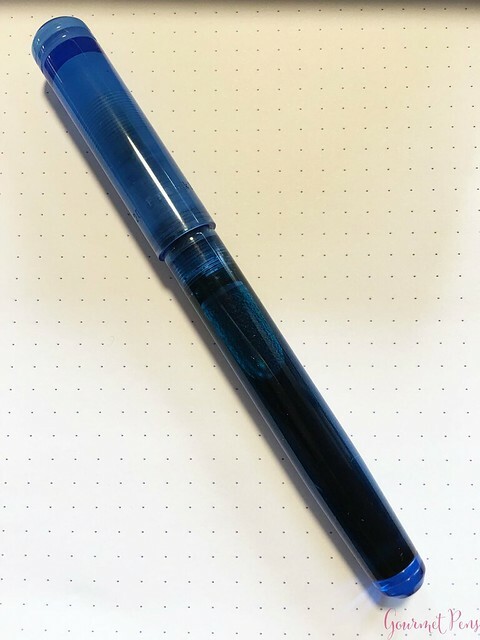 I typically use this as an eyedropper and it has never leaked with proper care (ie. not throwing it around). You can use the included cartridges or converter, though. This pen has no clip so the pen can roll but if it stops, it is almost always nib down. The section size might make you think it will be too small but it's actually quite comfortable for my grip, especially as there are no cap threads to disrupt the grip. It is not slippery and my grip stays put. It's very comfortable for longer writing sessions. The Model 20 feels good in my hand - well-balanced and easy for daily use because it's not particularly heavy. The cap posts snugly and securely, adding a touch of weight to the length of the pen and making the overall balance feel just right. I tend to use my pens unposted but both unposted and posted are options. 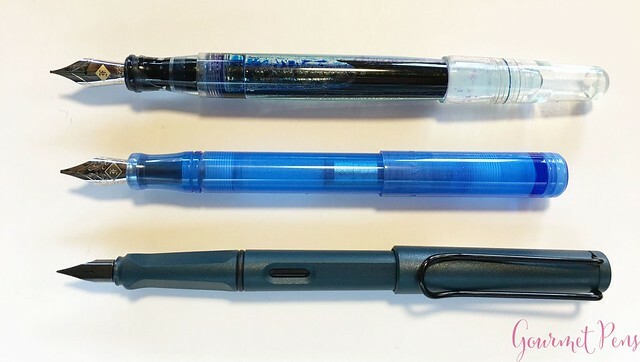 Top to bottom: Franklin-Christoph Model 66 Stabilis, Franklin-Christoph Model 20 Marietta, Lamy Safari. 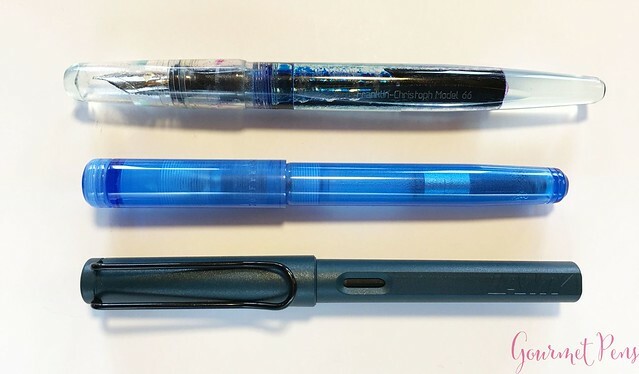 The one major downside is the recessed nib - if you ink via converter by dipping the nib into the ink bottle, it collects ink in the space and then you have to be sure to clean it out. As such, it's best to ink by removing the converter. 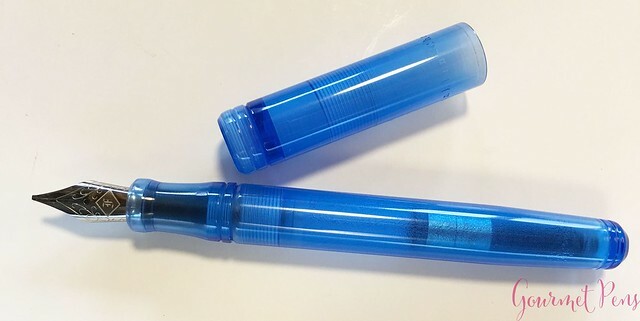 One more danger to consider: if you have a barrel full of ink and your friend tries the pen and doesn't realize it's eyedroppered and that it's a slip cap, you're going to have a mess on your hands. Speaking from experience. I love this model! I was at first hesitant about the slip cap but it's really snug and secure. It snaps in place and does not spin and it has not loosened up, despite many many cappings and uncappings. The cap was designed so pressure would be distributed away from the lip to prevent cracking since there is no cap band. 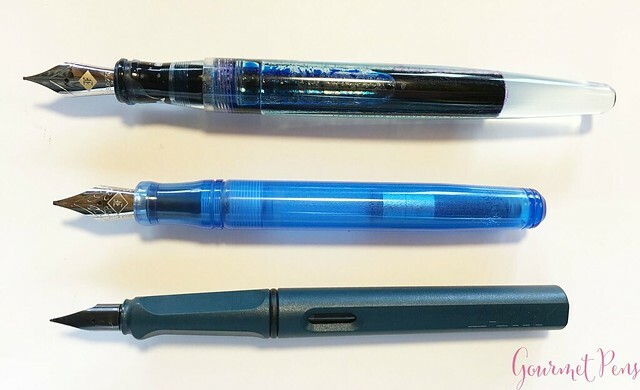 The cap interior releases air pressure so your ink does not get stuck in a vacuum and blob. The highlight is the eyedropper capability and the huge range of nib options. Take care when inking with a converter via the section, and make sure your friends don't unscrew the barrel when it's full of ink. Lifetime warranty included.